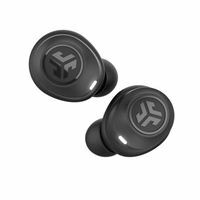 Grab your JBuds Air True Wireless Earbuds as you head to work, get to the gym, or jump on an airplane. A 3-4-hour battery life with Bluetooth 4.2 gives you just enough power to get through those must-have music moments. Their innovative charging case provides 10 extra hours to the earbuds. Intuitive and hassle free, JBuds Air automatically turn on and connect to each other right out of the case. IP55 - Protected from limited Dust ingress. Protected from low pressure water jets from any direction.